Most of our customers choose ‘All-In-One to Grade 5’ book, which is very popular. Not as many people are aware the split grade books exist, namely the ‘All-In-One: Grade 1-3’ and ‘All-In-One: Grades 4-5’ books, and even fewer people seem aware about the benefits of using this material. The purpose of this blog is not to explain why All-In-One music theory is such a different and highly effective method (to read about this click here), rather to make a brief comparison of the three main books in the All-In-One series (All-In-One to Grade 5, All-In-One: Grades 1-3 and All-In-One: Grades 4-5). Equipped with information, people who are already considering owning All-In-One music theory can make an informed decision about which book is most suitable for their needs. ♦ ‘All-In-one: Grades 1-3’ (158 pages) and ‘All-In-One: Grades 4-5’ book (166 pages) contain many more exercises than found in ‘All-In-One to Grade 5’ (278 pages). All-In-One: Grades 1-3 contains all the exercises found in grades 1-3 of ‘All-In-One to Grade 5’ PLUS 99 extra exercises throughout. All-In-One: Grades 4-5 contains all the exercises found in grades 4-5 of ‘All-In-One to Grade 5’ PLUS 113 extra exercises. Each of the split grade books is priced £9.99. For students who own both books (‘All-In-One: Grades 1-3’ AND ‘All-In-One: Grades 4-5’) this is the same as owning ‘All-In-one to Grade 5’ and the ‘Trinity Supplement’ book combined, PLUS 61 extra exercises. ♦ All-In-One: Grade 4-5 book is ideal for all students post grade 3, including those who feel rusty regarding their knowledge of previous grades. All-In-One: Grades 4-5 duplicates ten of the coloured reference pages found in All-In-One: Grades 1-3 (with other reminders throughout the book). These Reference pages are easy to find quickly and can just as easily be skipped over if a student already feels secure in these areas. This means that students who are not familiar with ‘All-In-One: Grades 1-3’ will nevertheless have a clear understanding of foundational topics such as Simple Time, Compound Time, Key Signatures and the Circle of 5th (topics already introduced in grades 1-3). It also means that students using All-In-One books may come to them from a diverse background; it is not necessary to be familiar with All-In-One: Grades 1-3’ book prior to using All-In-One : Grades 4-5’ book. So, which All-In-One music theory book is most suitable for your needs? We hope the above information has been helpful. In summary, If you wish to focus on Grades 1-3 we recommend you buy ‘All-In-One: Grades 1-3′ only. If you wish to focus mostly upon grades 4-5, buy ‘All-In-One: Grades 4-5’, regardless of whether you use ABRSM or Trinity College London syllabus. If you think the extra exercises unnecessary buy ‘All-In-One to Grade 5’ which nevertheless contains plenty of practice material. The last few months have been an exciting time for us at Aaron publications. 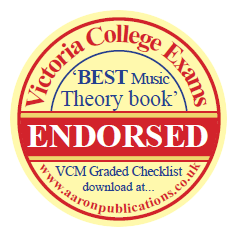 For a long time now I have been eagerly anticipating announcing the news that my All-In-One music theory books have been endorsed by Victoria College of Music Examination Board. What does ‘Endorsed’ mean? Quite simply, it means that Victoria College of Music Examination Board (VCM for short) have adopted my books for use with their students. They have given me their seal of approval, stating that, in their opinion, ‘All-In-One music theory’ books are the best material to equip musicians with the theoretical knowledge they require (VCM require candidates to hold Grade IV Theory or GCSE in Music to take Grade 8 practical on their chosen instrument. To read my blog about the importance of music theory and why it is important all musicians know it, click here). Moreover VCM examination board have designed their new music theory syllabus (Grades 1-5) around my All-In-One music theory books and are rewriting parts of their examination papers which means that my books can remain as they are with minimal changes required. It is a tremendous honour to have an examination board choose to use my material in preference to writing their own. VCM are an independent and international examining body in Music, Speech and Drama that has existed since 1890. They operate throughout the UK, various Commonwealth and a handful of other countries. As an independent examination board whose existence does not depend upon public funds, they are in the unique position of being unfettered by restrictions and thus ‘enabled…to respond to the needs of teachers and candidates in flexible ways’ (quoted from VCM’s own website https://www.vcmexams.co.uk/recognition.php). Victoria College state on the Home page of their website ; ‘We have one aim above all others and that is TO ENCOURAGE.’ They also state; ‘VCM advice is to enjoy examinations in Music, Speech and Drama for what they are: a yardstick to measure progress; encouraging candidates to further achievement, and supporting teachers in the independent sector’. It is a privilege to be working in partnership with an examination board whose values I respect and which is flexible in its approach as well as accommodating and quick to respond to student and teacher needs. For several months emails have been shooting backwards and forwards between myself and Stewart Thompson, Qualifications Manager at VCM, and I have had fun and satisfaction helping VCM ensure their new music theory syllabus works well with All-In-One music theory books. What changes are being made and when will the new VCM syllabus be available? VCM new music theory syllabus is now complete. All-In-One has been rewritten in a REVISED version especially for the benefit of VCM students. The Revised edition of All-In-One: Grades 1-3 book is now available on this website. Click here (note that the ‘REVISED Third edition’ is therefore different from the current ‘Third edition’). The Revised edition contains a ‘VCM Graded Course/Checklist’ and various footnotes throughout for ease of navigation, together with a few necessary adjustments to exercises in one of the ‘Diatonic Intervals’ papers so that it corresponds with VCM Key Signature requirements). The ‘REVISED Third edition’ of All-In-One to Grade 5 will not be available until 2020. 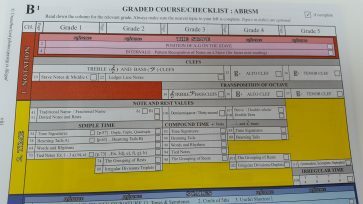 Until then, VCM students wishing to purchase the All-In-One to Grade 5 book (from us at Aaron publications) may request a FREE printout of the VCM course/checklist and altered paper, which will be sent together with any purchase order with the current version. To claim your VCM inserts simply leave a request for it in the comment box at checkout after you have placed your order for the current edition on our website (www.aaronpublications.co.uk) . For further information and to receive up to date news from us relating to All-In-One music theory please follow us on Facebook and Twitter. Please also see Victoria College of Music website (https://www.vcmexams.co.uk/ ) or Facebook ( https://www.facebook.com/vcmexams/ ) or Twitter (https://twitter.com/vcm_exams) where Victoria College of Music have posted announcements about our new partnership. More information, including a blog from VCM, will be posted shortly. All-In-One Music theory is also for Americans! I recently received a message from an American music teacher who wanted to know if my music theory books are suitable for her students because of a few different words we use in the United Kingdom for musical terms. Her only real concern was about note values because Americans describe them, quite sensibly, using fractional names (‘Whole, half, quarter…’ ) as opposed to UK musicians who not so sensibly (in fact quite illogically!) describe notes as ‘Semibreve, minim, crotchet’ etc. (Other differences in terminology are quite minor). This music teacher had seen a sample page on my website from All-In-One music theory book which uses both US and UK terms for note values and she wished to know my preference and the terms predominantly used elsewhere in my books. I have copied and pasted my reply below. Another stumbling block to American readers may be the titles of my books because some Americans are not familiar with the graded system and examination boards we have in the UK. The main books in the All-In-One series are ‘All-In-One to Grade 5’, ‘All-In-One: Grades 1-3’ and ‘All-In-One: Grades 4-5’ (The latter books are based on All-In-One to Grade 5 yet contain a significant number of extra exercises). In the UK ‘Grade 5’ is a significant bench mark and the All-In-One music theory books comprehensively cover both ABRSM and Trinity College London syllabus Grades 1-5. They also contain further topics (marked ‘optional’) outside the scope of both examination boards since, although my books feature graded checklists, they are not confined to syllabus requirements. To give you some idea; they are equivalent to RCM (Royal Conservatory of Music) music theory Grade 6 level which is used throughout Canada and in many parts of Northern America. They also include numerous topics from RCM Grade 7 and some from grade 8. Finally I should mention that my books have been tried and tested by a few American citizens with great results. For more reviews please go to… http://www.aaronpublications.co.uk/reviews-of-all-in-one-to-grade-5/). Our twitter handle is Aa_music theory. Aaron publications at Music and Drama Education Expo 2017 ! Aaron publications are proud to be listed as exhibitors at Rhinegold’s Music and Drama Education EXPO 2017 which takes place at London Olympia on the 9th and 10th of February 2017. Music and Drama Education EXPO is Europe’s largest conference and exhibition for anyone involved in music and drama education. Rhinegold’s Music and Drama Education Expo EXPO 2017 will be an important occasion for us, helping us raise awareness of the All-In-One series of music theory books. We celebrate the launch of two new books and three new editions (published July 25th 2016). ‘All-In-One: Grades 1-3’ and ‘All-In-One: Grades 4-5’ coincide with the new publication; ‘All-In-One to Grade 5 – THIRD edition’, on which they are based (containing extra exercises throughout). 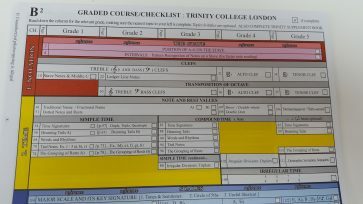 The ‘Trinity Supplement’ has also received a complete overhaul and contains many more exercises, all carefully graded so that our books are now as equally appealing to Trinity College London students as Associated Board students (and of course the other new edition is the Answer Book, which has had to be revised accordingly and contains answers to all the above books). Our books present THE most effective method for learning music theory and are so different to other music theory books in many ways. Read our reviews page at www.aaronpublications.co.uk to learn more. Details also can be downloaded about the differences between the new THIRD (2016) edition of All-In-One to Grade 5 and previous editions. If you happen to be in London between the 9th and 10 of February 2017 please pop along to see us at music and Drama EXPO 2017. You will receive a warm welcome and can chat to the author (Rachel Billings). The event will feature special one-off show prices for All-In-One music theory books.